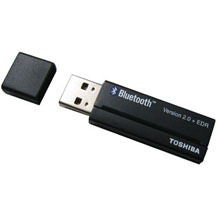 The Toshiba USB Adapter with Bluetooth 2.0+EDR Capability adds Bluetooth wireless capability to your PC enabling wireless communications with a wide variety of Bluetooth devices, including notebooks, desktops, PDAs, printers, scanners, digital cameras, cell phones, home appliances or any Bluetooth-enabled device. Bluetooth provides short-range wireless connectivity, even through walls and other obstacles, which makes communications between computers and peripheral devices easier than ever. Toshiba Bluetooth Stack (Bluetooth Utility) is suitable for TOSHIBA Bluetooth adapter. The Bluetooth Utility is a software tool used to configure a variety of settings once a connection has been established between the PC and the Bluetooth wireless technology device. It also facilitates the exchange of files between devices having onboard Bluetooth wireless technology.